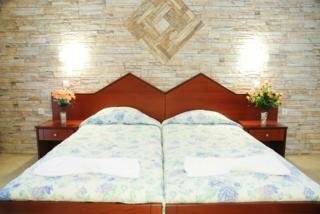 This family-friendly resort apartment hotel has a wide range of amenities for guests' convenience. It comprises a total of 98 rooms, and facilities on offer to guests at this air-conditioned establishment include a lobby area with a 24-hour check-out service, a welcoming reception area and a currency exchange facility. The younger guests can let off steam in the children's playground and there is a cafe, a bar, a snack bar and a breakfast room. Guests will appreciate the wireless Internet access and there is parking for those arriving by car. LocationThis hotel is located 10 m from shops, restaurants and bars and 50 m from the centre of Alykanas, which is one of the best resorts on Zakynthos. 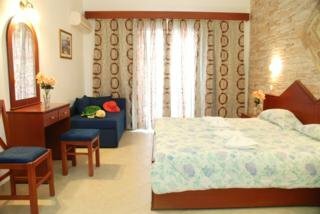 It is 600 m from the beach and is a quiet and welcoming place, making it ideal for families and couples. It is only 1 km away from the next resort, Alykes, 3 km from Zykynthos Museum, 10 km from Bohali Castle and 15 km from the shipwreck. RoomsAll of the studios and apartments come with a private bathroom with a shower, a WC and a hairdryer and offer a double bed. They are equipped with a TV and have a kitchenette with utensils, a fridge, a kettle and tea and coffee making facilities. All the rooms offer individually regulated air conditioning and heating and a spacious fully furnished balcony with either a view of the pretty landscaped gardens or swimming pool. SportThe hotel provides an outdoor swimming pool and a pool for children. There is a sun terrace and guests can relax on sun loungers or at the poolside snack bar. Guests can play pool/snooker and almost every night there are entertainment programmes such as quizzes, Greek nights or pool competitions. Moreover, sun loungers are provided for guests on the nearby sandy beach. MealsThere is a snack bar which is open all day, offering breakfast, lunch, refreshments and beverages. PaymentAmerican Express, Diners Club, MasterCard and VISA are accepted at this establishment. NotesThere is free parking and the reception is open between 7 am and 1 am.